Have to second Godard on that. Watching my DVD of the Marx Brothers' Duck Soup, one of the very greatest of movie comedies, I come to a favourite scene, early in the film. The madcap Rufus T Firefly (played by who else but Groucho Marx, painted moustache and cigar firmly in place) has just been appointed leader of the tiny republic of Freedonia. The amply proportioned Mrs Gloria Teasdale has donated 20 million dollars to save the country from bankruptcy. 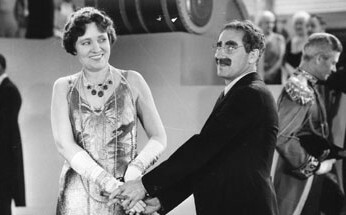 Mrs Teasdale is played by the delightful Margaret Dumont, who was the prime target for Groucho's many insults in film after film, and this is the first scene between the two in this movie. Naturally, Groucho lays into the woman with his trademark machine-gun delivery of non-sequiturs. Mrs Teasdale (gushing profusely): As chairwoman of the reception committee, I welcome you with open arms. Firefly (snapping back): Is that so? How late do you stay open? Mrs Teasdale (recovering with aplomb): I've sponsored your appointment because I feel you are the most able statesman in all Freedonia. Firefly: Well, that covers a lot of ground. Say, you cover a lot of ground yourself. You'd better beat it, I hear they’re going to put up an office building where you're standing. You can leave in a taxi. If you can't get a taxi, you can leave in a huff. If that's too soon, you can leave in a minute and a huff. You know, you haven't stopped talking since I came here. You must have been vaccinated with a phonograph needle. The subject of Mrs Teasdale's late husband comes up. Firefly: Is that so? Can't you see what I'm trying to tell you, I love you! Mrs Teasdale (rolling her eyes in adoration): Oh, your Excellency! Firefly (rolling his in imitation): You're not so bad yourself. And so on. Much as I'd like to, I can't quote all of Groucho's dialogue here - it would take up too much space and it would be pointless anyway, because to appreciate it in the truest sense you have to watch and hear him saying it. Duck Soup is a brilliant, subversive film about petty politicking and war-mongering, much more potent a satire than Chaplin's The Great Dictator (which was made seven years later). I've heard criticisms about how it doesn't have much of a storyline, that it's just a stitched-together collection of jokes and gags - but this isn't fair. Here's the basic plot: Ambassador of Sylvania calls President of Freedonia an upstart. Latter smacks former with a pair of rubber gloves. Former declares war on latter's country. That's a good enough storyline for any film, in my ever-so-humble view. But with so much brilliance from the finest set of comedians of the talking era, why would this one need a plot anyway? Like many other Marx Brothers aficionados, I sometimes find it difficult to look beyond Groucho - but Duck Soup provides Chico and Harpo (as a pair of spies) with some of their finest moments too: especially in the running gag about Harpo producing just about anything on demand, including a flaming blowtorch that he has hidden in a coat pocket. And the scene where a real dog emerges, barking, from a house painted on his chest is worthy of a Dali-Bunuel collaboration. The other thing that struck me was how important Margaret Dumont's own personality is in the scenes between her and Groucho. 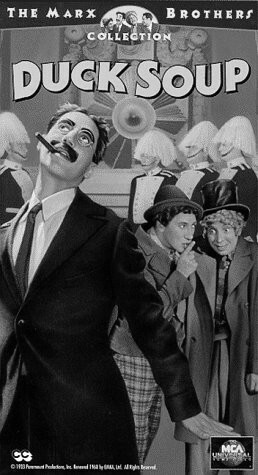 Conventional wisdom tells us that her role in these films was to be a mere foil, a bouncing board for Groucho's lines. But that isn't quite accurate. One of the reasons why the exchanges between them work so well is that Dumont is always so good-natured. At most, when Groucho says something particularly insulting, her brows furrow and she looks around, flustered - but then, a couple of seconds later, she's back to smiling luminously at him. It's almost like a fond aunt indulging a loopy nephew. They get my vote for the Greatest Onscreen Couple ever. Links: A comprehensive scene-by-scene write-up on the film from Tim Dirks' Film Site. And a nice collection of Groucho quotes. Enjoy--to some extent--your blogs, especially the Hitch digressions, but you need to broaden your scope and dip into writers and film directors like Nathaniel West("Miss Loneyhearts"; "Day Of The Locust"); Horace McCoy("They Shoot Horses Don't They"); Director Joe Losey's "The Servant"(Dirk Bogarde brilliant! ); Robert Towne and Roman Polanski's script & film of "Chinatown"(Best thingy out of Hollywood in the last half-century. Believe it, Yaar);"Pretty Poison"(Tony Perkins & Tuesday Weld; Noah Black directing; Boffo! );Charles Laughton's "Night Of The Hunter"(Robert Mitchum and Shelly Winters outhitching Hitch); late Orson Wells("Touch Of Evil"). Can't thank you enough for writing about my all time favourite movie. I am double dipping tonight for a MB^2 - Duck Soup and Horse Feathers - my two fave comedies of all time..
First Anon: Have seen all the films you mention, enjoyed most of them (despite being a big fan of both Laughton and Mitchum, I thought Night of the Hunter was slightly overrated). But much as I'd like to, there usually isn't enough time or a context to write about older films - unless I've re-watched one of them on DVD and want to make notes about it. I've often wondered with delight what would result if Kishore Kumar met the Marx Brothers. Sometimes watching him I feel he embodies aspects of all of them together (in a role like the Guruji in Padosan, for instance). you never know what he'll do next. i suppose Chalti Ka Naam Gaadi is the closest they get to a Marx brothers collaboration. "What's that? A post? I don't want a post, I want a position. Preferably a horizontal one. Otherwise I'm not going to take this lying down." :-). Nice one, Jai. happy memories. One of the other things I've noticed about Chaplin and Marx(es) is the way they include visual elements of comedy to sync with fantastic musical elements. The music is often brilliant and quite a few comic scenes are weaved into the music. One would not be funny without the other. Not to mention the fact that Chico is a wizard on the piano. Fiorello: You can't fool me! There ain't no Santa Claus! Otis B. Driftwood: Do they allow tipping on the boat? Otis B. Driftwood: Have you got two fives? Otis B. Driftwood: Well, then you won't need the ten cents I was gonna give you. Witness Chico trying to peddle 'tootsie-frootsie' ice-cream in 'A Day at the Races'. "Two hard-boiled eggs" and " The body the first" would make it "A night at the opera" for preference over "Duck Soup". I got 7 letters for you, hon: ZVBXRPL. My favourite scenes are both with Harpo. In Big Store when a woman is looking for the same material as her dress to make a matching hat I think. Harpo then cuts a piece off the back of her dress, she then decides against buying the piece and walks off, the camera showing the huge chunk missing from her dress as she leaves, she oblivious. The second is in the bar in Go West when Harpo pulls a brush out of his pocket instead of a gun. out loud, more so than the witty remarks made by Groucho. I suppose it is possible now to buy the DVD's, I think I will buy them all as I haven't seen these films for a long time.